I have to admit, this card was totally inspired by Beth Norman;s blog post here - http://www.sunflowers-dragonflies.ca/blog/49123/new-release-for-technique-junkies-and-news/, You will need to scroll down to the last card on this blog post. Her card is so gorgeous! I treated it slightly differently. I used dark purple card stock and she didn't. I used an iridescent embossing powder and she didn't. I have a greeting on the front and she didn't. 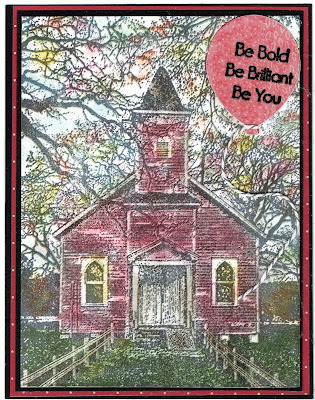 But we both used the same Technique Junkie stamp Country Church - http://techniquejunkies.com/country-church/ - for our focal image. 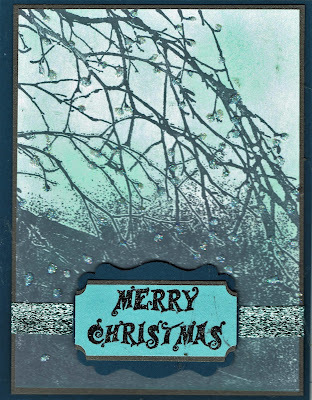 I also used the Merry Christmas from Technique Junkie Stamps Christmas Ornaments Trio - http://techniquejunkies.com/christmas-ornaments-trio-set-of-9/ . Because of the iridescent embossing powder -- this card simply sparkles! I will be finishing my Christmas cards today. Then to finish my annual letter, address envelopes, and get my cards in the mail. Have a great day -- and get inky! There is nothing quite like silver and gold that speaks of Christmas to me -- and I suspect to most people. I chose this lovely card stock color for this card. Lest you think that Design Team member never mess up on cards -- let me change your mind! I "knew" that embossing powder often spread and I knew therefore you can have difficulty getting words to emboss and look good. That is especially true if the font is small and close together. I just didn't think that these words were in such a small font, but oh yes they are! I had stamped them in Versamark and then covered with silver embossing powder. Oh, it was bad! I evidently do not have "detail" silver embossing powder! The words were a total mess. So I had to start over. The second time I used Stazon silver metallic ink. The problem with that ink is that it dries very quickly so you must get the stamp die covered and stamped quickly. That took me several tries to get a successful image stamped. Then I cleaned it right away with Stazon cleaner. This ink doesn't come off easily even with Stazon cleaner. 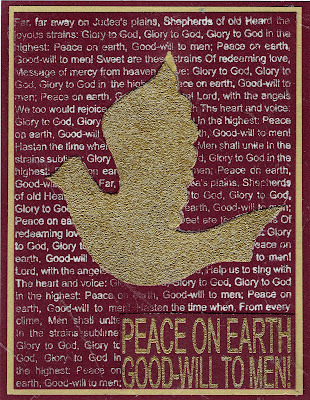 I am using Technique Junkie Peace on Earth Dove - http://techniquejunkies.com/peace-on-earth-dove/. Next I reinked with Versamark the area around the dove and the larger block words in the bottom right corner. I covered the ink with detail gold embossing powder and heart embossed. Then I "fussy cut" out the dove and used dimensional to pop it up. I did the same the block words at the bottom. 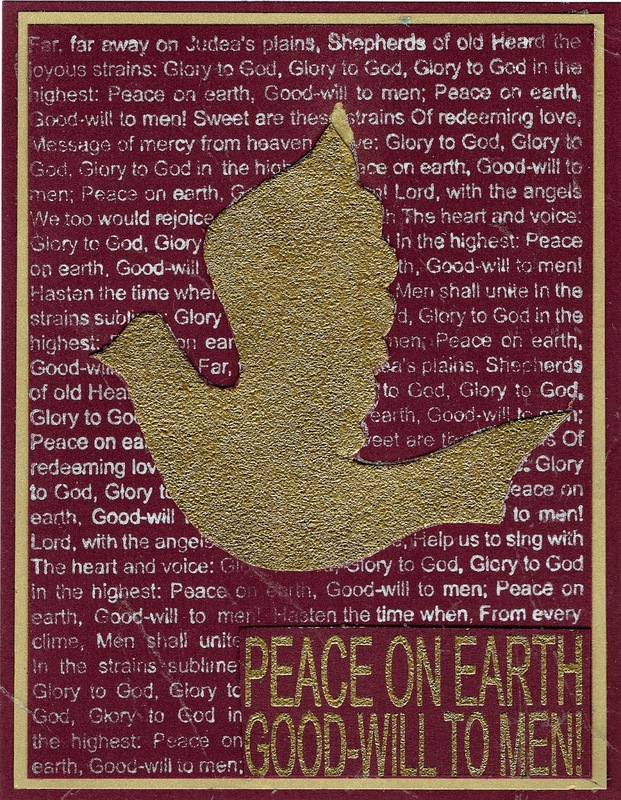 I layered it on gold and then on the burgundy card stock to complete the card. Don't forget all Technique Junkie Christmas stamps are on sale 25% through December 15. Now to finish the rest of my cards, get presents wrapped and under the tree, and start on Christmas baking! -- Have a great day and get inky. Those of you who may follow my blog may remember the scene I painted last year -- after Christmas. So now here it is all together for my Christmas decorations for this year. This year I am having a little difficulty with my decorations. This is the first time in 48 years I had to set up the tree and make sure all the lights work, etc. I am not enjoying this part at all. Hope you are preparing for your Christmas celebration -- and getting inky! 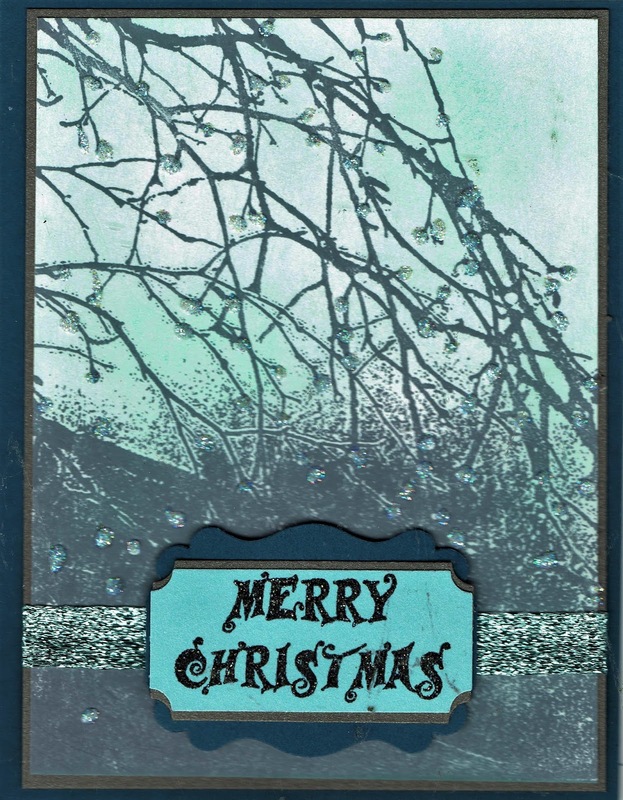 I created this card with Technique Junkie stamps. The stamps are Angel . with Lute - http://techniquejunkies.com/angel-with-lute/, and words from Christmas Ornaments Trio - http://techniquejunkies.com/christmas-ornaments-trio-set-of-9/. I used some Zig Watercolor Markers to color the angel. I mounted the focal image on several layers, and placed it on some designer paper. The words were stamped with Versafine Black ink and heat embossed. Have a great day -- and a great Thanksgiving! After dinner -- you might want to get inky! 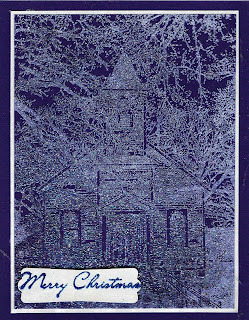 This is another easy card - which most of us need at this time of the year!I first stamped the song background - TJ O Holy NIght - http://techniquejunkies.com/o-holy-night/ with gray ink. Next I used an "Embossing Buddy" over the entire are. I stamped the TJ - The Greatest Story" stamp - http://techniquejunkies.com/the-greatest-story/. with Versamark ink and covered the stamp are with white embossing powder and heat set. Then I sponged blue ink over the embossed area. The white embossing area wasn't showing up as much as I wanted it too. So I decided my old favorites - Antique Glimmers! Now the embossed area shows clearly. I added layers to the focal image and a bow using my Bow Easy. Don't forget ALL TJ Christmas stamps are 25% off through December 15! Day 3 of the 30 Days of Christmas! Day 3 -- it is always exciting to see what each Design Team member does for these 30 Days of Christmas. I find it to be inspiring! And their cards spur my own creativity! For this card I used Technique Junkie Pine Cones - http://techniquejunkies.com/pinecones/ and Technique Junkies Merry Christmas - http://techniquejunkies.com/merry-christmas-2/. I used a dark teal paper and Versamark ink to stamp the panel. Then I inked a center portion of the stamp with Versamark ink on the same dark teal card stock. I heat embossed that section with white embossing powder. I used a large scallop punch to punch out the section of the embossed image I wanted to highlight. I also used the scallop punch to punch a dark teal scallop, ans a circle of white glimmer paper. The dark teal panel is layered on white glimmer paper just as is the circle. Glimmer spray is spritzed on the dark teal panel. Flatter means easier mailing, and at this time of the year easy mailing is important A ribbon tied around the focal image group, The circles layer was just adhered flat -- it is not popped up with dimensionals. Flatter means easier mailing, and at this time of the year flatter is better! And --- all Technique Junkie Christmas Stamps will be 25% off during this 30 Days of Christmas - November 15-December 15, 2016. Day 1 - of the 30 Days of a Technique Junkie Christmas! 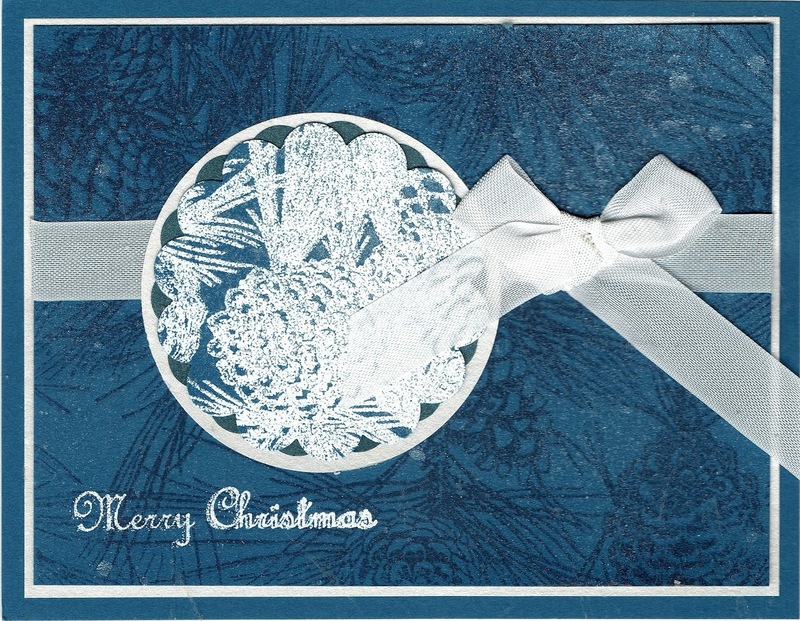 This is a bit out of the box Christmas card but it is really pretty -- in real life! This is Day 1 of the 30 Days of Christmas with Technique Junkie Stamps. This is my own blog but there will be a lovely card each day now - with December 15 as the last day - on the Design Junkies blog - http://techniquejunkies.blogspot.com/ . So be sure start with a stop there for the next 30 Days! And --- all Tecxhnique Junkie Christmas Stamps will be 25% off during this 30 Days of Christmas - November 15-December 15, 2016. 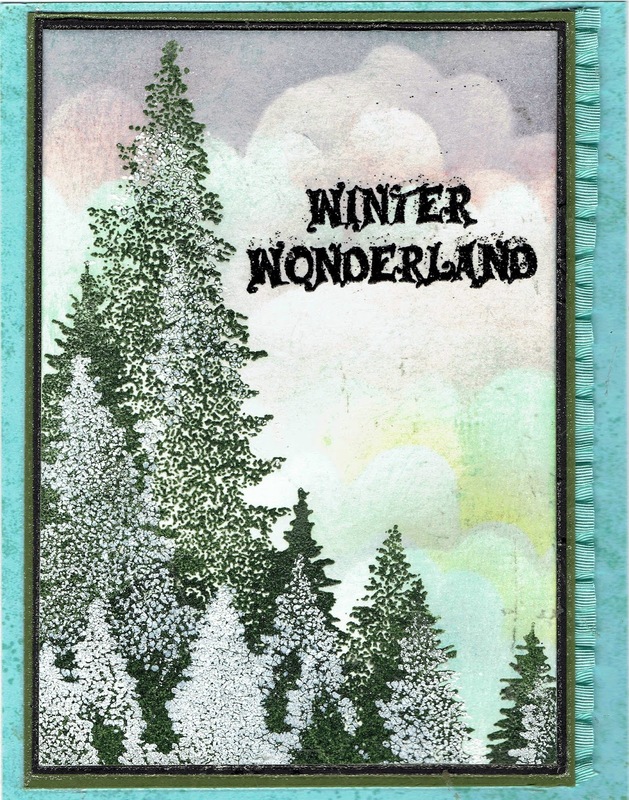 I used this wonderful Technique Junkie stamp - Glowing Branches - http://techniquejunkies.com/glowing-branches/- and Technique Junkie Winter Wonderland http://techniquejunkies.com/winter-wonderland-sayings-set-of-3/ stamp sets to create this card. I used Memento Gray Flannel to stamp the branches, and I heat embossed the greeting in black ink and black powder. I sponged the sky behind the branches. But and I oh so wish you see this card because it just really sparkles! At the end of each branch tip I added iridescent blue glitter glue. Oh, it is just so pretty! You can see the little dots - now just imagine the sparkle! Punched our greeting panels and super sparkly ribbon finished the card. Have a great day - and get inky! This is not necessarily a Christmas card, but it sure could be. It involved some creative stamping but it was not hard to do. I had this vision in my mind of snow covered trees in the forest. I first stamped the trees (Technique Junkie Stamps Hillside Pines - http://techniquejunkies.com/hillside-pines/) with a nice dark green ink. I stamped them in layers - one on top of the others. I then cleaned my stamp very well. I used a heat tool to dry the green ink. Then I used my embossing buddy over the entire sheet of card stock so I wouldn't get embossing powder where I didn't want it. I inked my tree stamp lightly with Versamark ink. I didn't want to get a solid image. I did not use my MISTI because I didn't want to have the Versamark exactly where my green trees were stamped. Then I covered the Versamark with white embossing powder and heat set. I repeated this process over both the tall and short trees. Then I used my handmade and home drawn could stencil. Sponging different colors over the different sections of the stencil gives a unique look and no sky will ever look exactly the same. 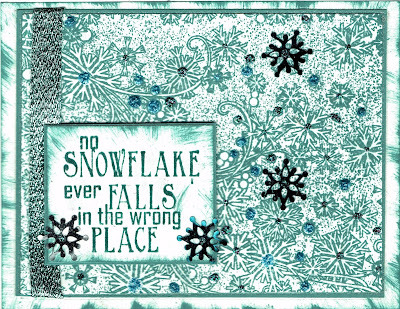 Then I used the Winter Wonderland stamp from the Technique Junkies Winter Wonderland Sayings set - http://techniquejunkies.com/winter-wonderland-sayings-set-of-3/. Several layers and ruffled ribbon finish the card. Enjoy your winter. 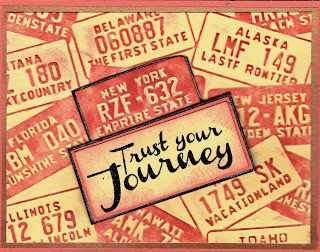 I saw this embossing folder at a recent stamp convention before I received this November Technique Junkie stamps Trust Your Journey - http://techniquejunkies.com/trust-your-journey/. I ran the yellow card stock placed in this license plate embossing folder through my Big Shot machine. Then I used a very stiff sponge with dye based ink over the embossed area of the card stock. I ran a second small piece of card stock over the New York license plate area. I used the sponge there as well. I cut out just that license plate and mounted it on black card stock and trimmed it by hand. The verse was stamped with Versafine black ink and covered with black embossing powder. The edge was sponged and then layered on two layers of card stock. Both the license plate and the verse are popped up with dimensionals. I am truly into easy Christmas cards - not just this year, but every year! This is pretty easy. I used Technique Junkie stamp set called Christmas Sponge Set - http://techniquejunkies.com/christmas-sponge-set/. And the Merry Christmas words are from a Technique Junkie Christmas stamp set called Christmas Ornamanets - http://techniquejunkies.com/christmas-ornaments-trio-set-of-9/. Those words are heat embossed to stand out against the designer paper. The four images were stamped with dye based ink on glossy paper. I heat set the stamped images so the ink wouldn't smudge as I punched the squares! Then I cut out the scalloped squares. The squares were layered on the scalloped squares. Then they were placed on the already adhered designer paper. The greeting was heat embossed on the designer paper. Have you ever looked at a detailed photo stamp (or almost photo stamp) like this newly released Technique Junkies stamp Country Church - http://techniquejunkies.com/country-church/ - and thought to yourself, "I like this stamp but it is so detailed it will hard to color in?" I want to tell you this was EASY-PEASY to color! You just need to know the right rick! I laid my card stock in the corner of the MISTI. Then I positioned the stamp where you want it on the card stock. I closed the lid of the MISTI firmly to be sure the stamp clung to the lid. Then I inked up the stamp die with Memento Gray Flannel ink, and closed the lid pressing firmly over the back of the stamp. That transferred the image to the card stock. The lid became my acrylic block handle for my stamp. Then clean your stamp leaving it ON the lid. Then ink up the stamp die once more with Versamark ink, close the lid, and once again press firmly on the lid to transfer the ink to the card stock. Because I used the MISTI the Versamark ink is now exactly on the same lines as I first stamped the image in gray! And now for the magic. Using a chalk applicator place the chalk color on the image where you want it. Because the Versamark is sticky, it holds the chalk in place. It colors in very quickly! I did add some blue here and there between the tree branches to add some depth to the sky. However, even though the Versamark will hold the chalk - the plain areas of blue sky will not hold the chalk so I needed to use a chalk fixative. I used Winsor & Newton Artist's Fixative Spray. Some brands of artist's fixative sprays are very "stinky" - this one is not so bad. I have no idea which big box store I bought it at, as I have have it a long, long, long time -perhaps over 10 years. 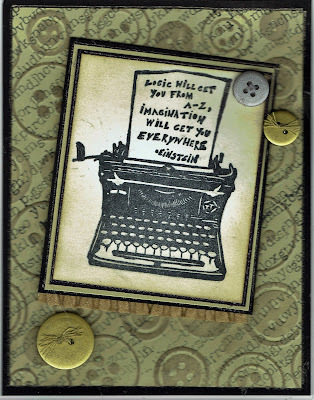 I wanted to add a saying so I chose Be Bold sentiment from the Technique Junkies stamp set Typewriter Set - http://techniquejunkies.com/typewriter-set/. It was stamped on Vellum and punched out. I also punched out a second balloon from red card stock. I adhered them together using a small Xyron machine. I added some twine and it is floating in the sky. After my husband passed away very suddenly, my daughter and family moved back home from Europe. That meant my large stamp room (11x14 feet) needed to be moved upstairs to a much smaller room (about 9x10 or so). I got rid of a lot of stamps and other supplies then via a garage sale and selling boxes of “Grab Bag” stamps. Here am I again – a much smaller room and the very really need to downsize my extensive stamp collection much farther. So I am selling Grab Bag boxes of stamps. The stamp companies represented in what I am selling are Stampin’ Up, Close to My Heart, Artistic Out Post, Paper Bag Studios, Stampers Anonymous, Sweet and Sassy Stamps, and more. Some are clear acrylic stamps and most are rubber. The themes run the gamut – Christmas, birthday, floral, children, words, borders, background stamps, and more. I have no idea which stamps are in which box. Stamps are all cling of some kind – there are no wood backed stamps. All stamps are in Ziploc bags and no cases are provided. The medium size flat rate boxes contain several hundred dollars worth of stamps and I am asking $40 – which is postage paid. The small size flat rate boxes hold several bags of stamps and at least 3-4 bags. I am asking $15 postage paid. I will only accept Pay Pal and will only mail within the United States. Please mail me if you are interested in purchasing a box, and I will let you know my Pay Pal address. Please post a comment and I will contact you. I will send you an invoice. I have five medium size boxes and 8 small boxes to sell. Happy November! Happy Blog Hop Day! Happy, Happy Stamping! 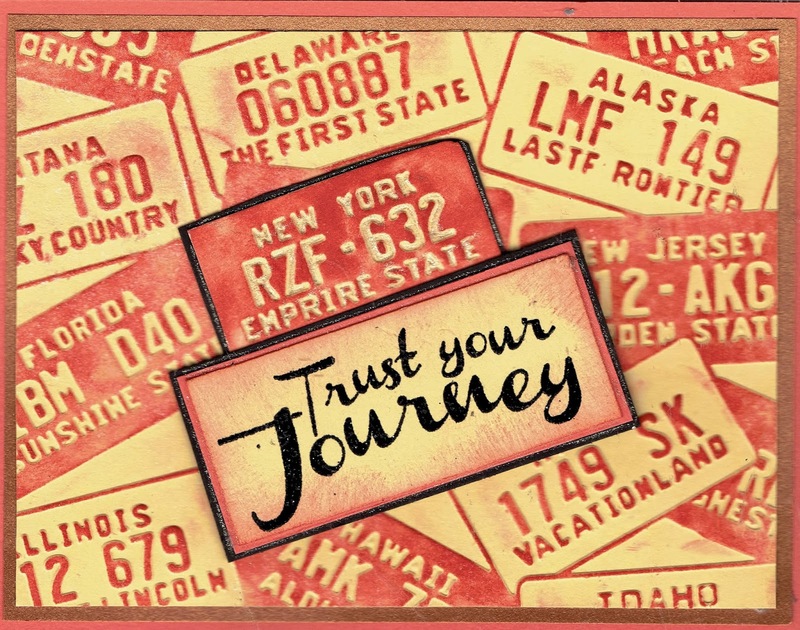 Today is Technique Junkies Stamps Blog Hop Day! As usual, there is a 15% off all November release stamps from 11-1 to 11-08-16. The Discount will show up in your shopping cart. Every member of the Technique Junkies Design Team receives stamps from our fearless leader, Pat Huntoon. But we do NOT receive the same stamps. Since the Christmas release was in October -- the November release does not feature true "Christmas" stamps. There are certainly some "winter stamps." And because we are different -- each Design Team members views the new stamps differently and ends up creating cards and projects just as differently! I look forward to seeing just how each DT member uses the new stamps in different ways. And so here is MY take on a few of the NEW releases of Technique Junkies stamps! The above monochromatic card was created with two new Technique Junkie stamps! They are Snow Swirls http://techniquejunkies.com/snow-swirls/ and Snowflakes Fall - http://techniquejunkies.com/snowflakes-fall/ . 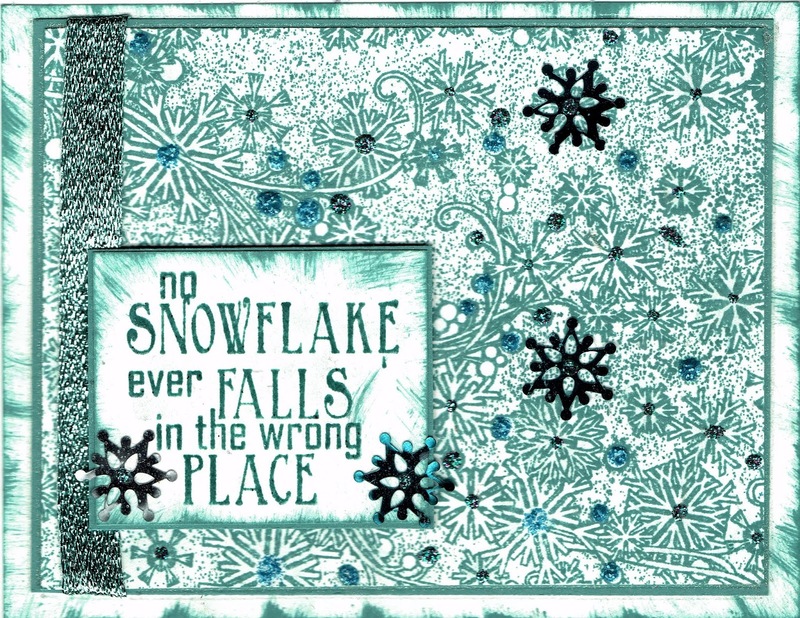 I stamped the snowflake background stamp in blue and layered it and and the greeting on matching blue card stock. The focal image panel was wrapped with a shimmery blue ribbon. Blue foil embellishments were adhered here and there. I added blue glitter glue in many places to add additional shimmer! However, I wish snowflakes didn't fall in my driveway! I so remember Louis Armstrong singing this wording in that gravely voice of his. It is called Wonderful World - http://techniquejunkies.com/wonderful-world/ - a new technique Junkies Stamp! Do you remember it as well? I used the new Technique Junkies Stamp Hillside Pines - http://techniquejunkies.com/hillside-pines/ - stamped several times to create the tree line. 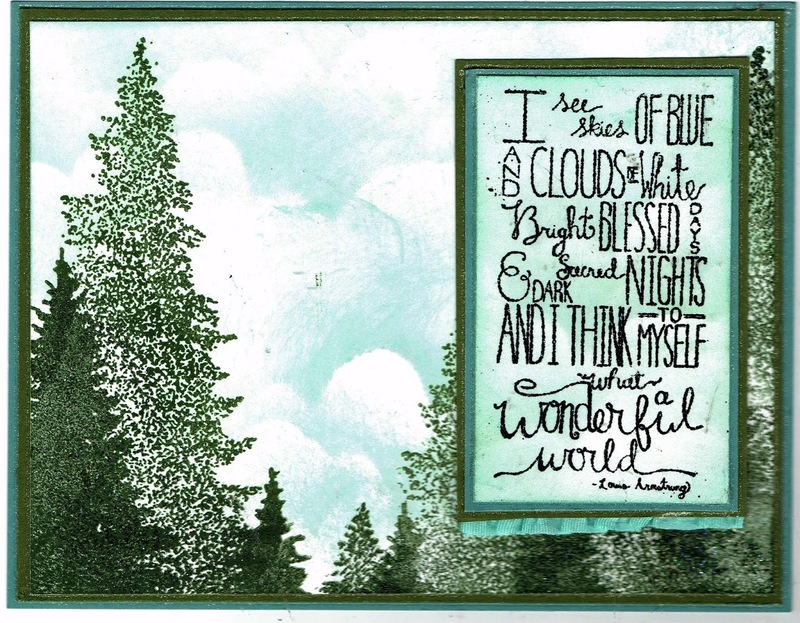 I used a had drawn cloud stencil to create the sky both behind the trees and the words of the song. 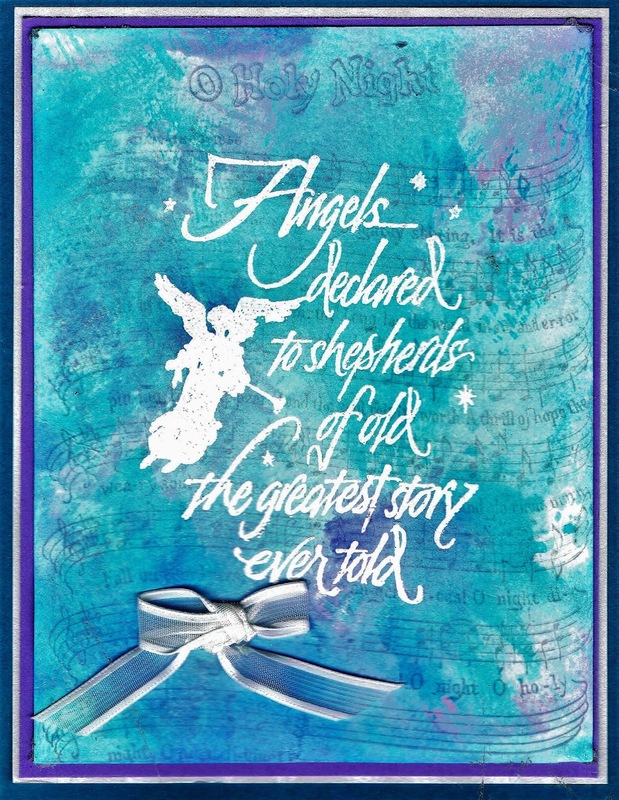 A ruffled ribbon was added and a few lines with a Star Dust gel pen. I laughed when I saw this new Technique Junkies stamp of an antique typewriter called Typewriter Set - http://techniquejunkies.com/typewriter-set/. I decided to just stamp the typewriter in black ink and not heat emboss it. The set comes with a variety of sayings to to stamp on the "sheet of paper" in the typewriter. There is enough room to easily stamp it correctly. Pat was careful with her trimming of the saying stamps so each of us can stamp this easily and correctly every time. I used Random ABCs - http://techniquejunkies.com/random-abcs/ - and stamped it at an angle a couple of times. I also used a button embossing folder. I used a stiff foam sponge to apply ink just to the surface of the embossed areas of the card stock. I added a few metallic finished buttons and a piece of ruffled ribbon as embellishments. 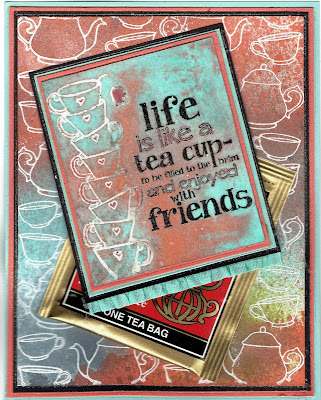 My last card for the Blog Hop feature some hot tea! I make a pot of hot tea every morning. As my sister says, "I am not old enough to drink coffee!" Now my almost white hair might be misleading.
. I used the new Technique Junkies stamp called Teatime - http://techniquejunkies.com/teatime/ , The saying is also a Technique Junkies Stamp called Like A Teacup - http://techniquejunkies.com/like-a-teacup/. to create this panel I used a Versamark marker to ink up the tea cups. Then I carefully used my black Versafine ink pad to only ink up the the words because I felt the words would stand out better from the panel if they were stamped in black. I covered both with clear embossing powder and heat set. Then I applied Art Anthology Colorations spray and wiped up the excess. I used the smallest end of a coral marker to add a little more color to the tea cup handles, the tiny hearts, the tea bag tag, and the open spaces in the letters of some words. After creating all of the various card stock layers I used then I decided I should use a tea bag as an embellishment. I looked at all of my stash of tea bags and chose this one because of the colors in the packet. I hope I have enticed you to "hop along" on the rest of the blog hop! 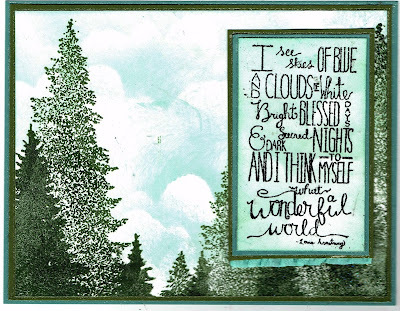 Please be sure to go to the next blog on this hop - the very talented Tonya Davidson: http://stampintonya.blogspot.com! 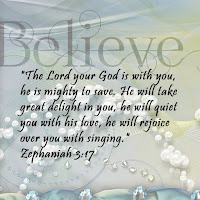 Judy Jackson: http://judysstampart.blogspot.com - You are here. Tonya Davidson: http://stampintonya.blogspot.com - Go here next. A final two things for you to know and remember; The Technique Junkies Design Team will be hosting the “30 Days of Christmas” from 11-15-16 to 12-15-16. That means each and every member of the TJ Design Team will be focusing on using Technique Junkies Stamps to create Christmas cards during this time period. 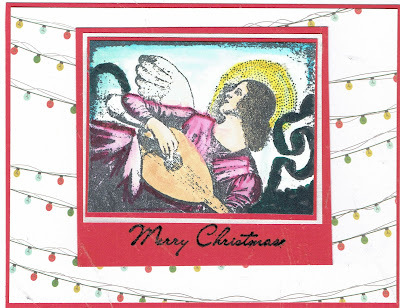 During that time I will focusing my attention on using TJ stamps to create Christmas cards and they will appear on my blog at least 3 times a week during this time period. I will be trying to create cards that are easily replicated because I know just how busy this time time of the year can become. And second - Please remember there is a 15% off all November release stamps from 11-1 to 11-08-16. 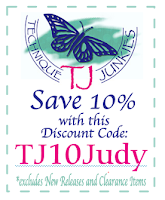 The Discount will show up in your shopping cart. So start shopping! Have a wonderful day -- and get inky!